Yammer isn’t going to be a very useful business tool for you if your colleagues aren’t using it. How can you leverage a social network if you’re the only one on it? Needless to say, that’s not much of a social network. The easiest way to get the word out there about Yammer is to invite others to join. Yammer makes this very simple. From the Home screen, select the Invite button. 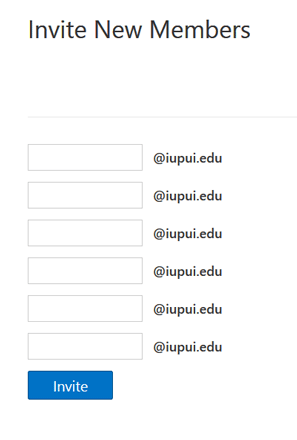 Yammer opens a page with multiple fields for entering the names of those you’d like to invite, with the domain email name already conveniently entered for you. You can only invite and see members who have the same email domain name as you. For example, if your email is me@iworkhere.com, you will be able to see only others with emails that end with @iworkhere.com. Tell people you’re on Yammer and how much you like it. Welcome newcomers as they join. Post links and articles that others will be interested in viewing. Post project files for easy access and let users know they are available. Poll people on important topics. Develop a contest for coworkers and post it. Tag people in significant comments or posts. Develop a group to answer questions or concerns about using Yammer. Encourage others to use Yammer’s mobile apps for convenience. Suggest using Yammer as a replacement for face-to-face meetings, when appropriate. Yammer is a social network for business. While you don’t want to get overly personal with your posts, that doesn’t mean you have to be formal and stiff. The site is there to help you be social, so don’t deny yourself or others that significant element of a working relationship. It’s okay to have some appropriate fun.